Heat a large nonstick skillet over high heat. Add 2 teaspoons of the oil and heat. Add the broccoli stems, and stir-fry for 30 seconds. Add the florets and the remaining garlic, ginger, 2 tablespoons of water, and season with 1/4 teaspoon salt, and pepper. Stir-fry until the broccoli is bright green but still crisp, about 2 minutes. Transfer to a plate. Get the skillet good and hot again, and then heat 1 more teaspoon oil. Add the chicken and chili flakes if using. Stir-fry until the chicken loses its raw color and gets a little brown, about 3 minutes. Add the hoisin sauce, return the broccoli to the pan and toss to heat through. Stir in the reserved cornstarch mixture and bring to a boil to thicken. Add more water if need to thin the sauce, if necessary. Taste and season with salt and pepper, if you like. 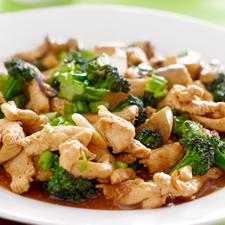 Mound the stir-fry on a serving platter or divide among 4 plates and garnish with sesame seeds; serve with rice. Per Serving: 262 Calories; 8g Fat (26.3% calories from fat); 1g Saturated Fat; 30g Protein; 18g Carbohydrate; 4g Dietary Fiber; 66mg Cholesterol; 556mg Sodium. Exchanges: 0 Grain(Starch); 3 1/2 Lean Meat; 1 1/2 Vegetable; 1 Fat; 1/2 Other Carbohydrates.